As far as investors are concerned, Bank J. Safra Sarasin sees its role as a sustainable asset manager with a long-term perspective. Active Ownership, comprising of engagement and proxy voting, is an important component of this process. The Bank’s approach is not only designed to encourage robust corporate governance structures but also to ensure that the rights of shareholders are protected. In the same vein, we aim to encourage forceful initiatives in the social and environmental domain, together with greater transparency, so as to produce a positive impact. Bank J. Safra Sarasin has its own Active Ownership approach (comprehensively revised in 2016) which includes elements such as the Active Ownership Policy, the operational Proxy Voting Guidelines and client-specific reporting. The approach is aligned with Bank J. Safra Sarasin’s sustainable investment methodology and takes into account numerous international guidelines and standards such as the United Nations Global Compact or the OECD Guidelines for Multinational Enterprises. The Bank’s Active Ownership activities can be split into four relevant areas. Every year, Bank J. Safra Sarasin’s sustainable investment analysts and portfolio managers meet with the management of around 500 companies to discuss material ESG issues relevant to the specific business case. In addition, there are concrete, more extensive dialogues over a longer period to provide a more detailed understanding of strategically relevant ESG issues or to improve investor communication in the area of sustainability. In cases where companies are not aware of relevant ESG risks and/or manage them insufficiently, Bank J. Safra Sarasin would downgrade their sustainability rating and refrain from an investment as the last step. Bank J. Safra Sarasin collaborates with other investors in order to maximise the impact of engagement initiatives and is currently active in various initiatives through the Principles for Responsible Investment (PRI) that offers the largest global platform for Collaborative Investor Engagement activities. Bank J. Safra Sarasin is a member of the Carbon Disclosure Project (CDP). These organisations help investors to build up knowledge and skills and give broader access to information. 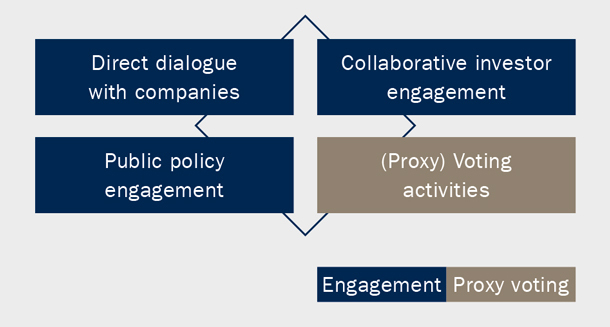 Bank J. Safra Sarasin actively participates in political dialogue in various ways. Through involvement in leading sustainable investment initiatives and organisations such as Eurosif and Swiss Sustainable Finance (SSF), the Bank fosters contacts with politics and other stakeholders to promote the consideration and integration of relevant ESG themes on a regulatory level as well. The Bank is also committed to promoting a better understanding of sustainable investments. For numerous sustainable investment funds as well as for institutional mandates, voting rights are exercised by J. Safra Sarasin taking into account environmental, social and corporate governance criteria. Although the majority of votes concern corporate governance issues, J. Safra Sarasin also considers social and environmental issues. Bank J. Safra Sarasin votes in all relevant countries. In so doing, the Bank receives operational support from Institutional Shareholder Services (ISS). The votes, however, are always cast in line with the Bank’s own customised operational Proxy Voting Guidelines.